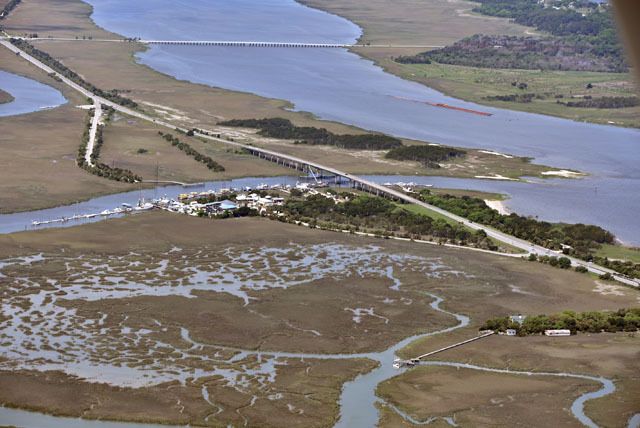 By Skyhawk to Florida – Day 7 – Clearwater to Ocean Isle, NC – EHFC Members Talking! We’re on our way back to Ithaca. When we checked the weather this morning, it looked reasonable, except for a cold front right across the Florida peninsula, about halfway between Tampa and Jacksonville. 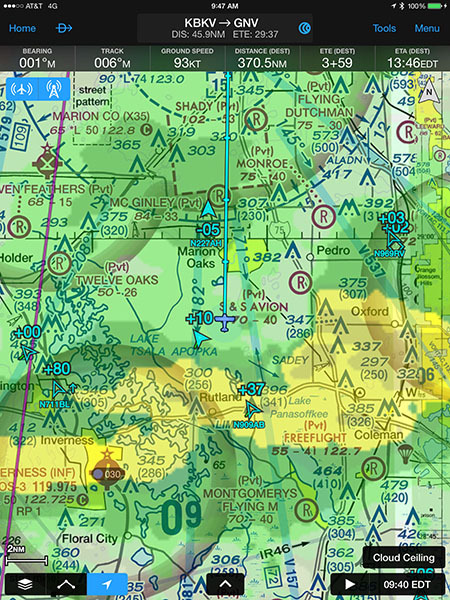 Still, all the airports in the area were reporting VFR, so we decided to give it a try. With a narrow band like that, you can always turn around, or if it’s just raining, you’ll be out of it in a short period of time. We loaded up N46493, dropped off the rental car, and said goodbye to the folks at Clearwater Airpark. The ceilings weren’t too bad, and Tampa cleared us into the Class B as soon as we called them after taking off. They warned us about moderate to strong precipitation about sixty miles north, but we could see a long way and the horizon was clear, so we pressed on. Further north, the Garmin Pilot radar display on the iPad started showing precipitation ahead. Mostly green, but some areas of yellow and orange and even “Danger Will Robinson!” red. However, we still could see perfectly well out the window, and trusting our eyes more than electronics, we continued northward. Before long, we hit the precipitation. How bad was it? Let me put it this way – if I were standing out in it, I wouldn’t have bothered to put on my raincoat. Light drizzle at best, and over in a minute or two. Complete non-event, proving it pays to go look, as long as you leave yourself an out. By the time we hit Gainesville (KGNV), there was a low deck of scattered clouds, but not much more. The deck got thicker, but still broken, so as we neared the Georgia Coast we dropped through a gap to fly on under the clouds at about 1,800 feet. 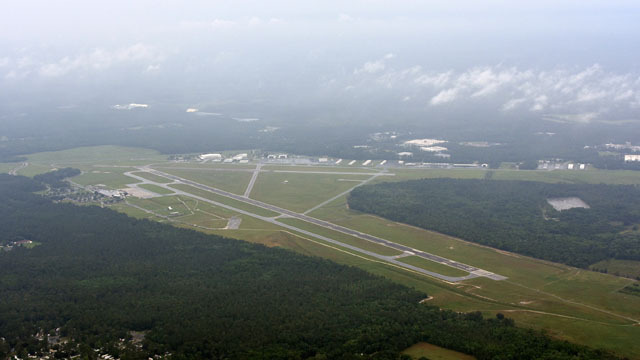 After crossing over St. Simons Sound, we were on final for Runway 4 at KSSI. 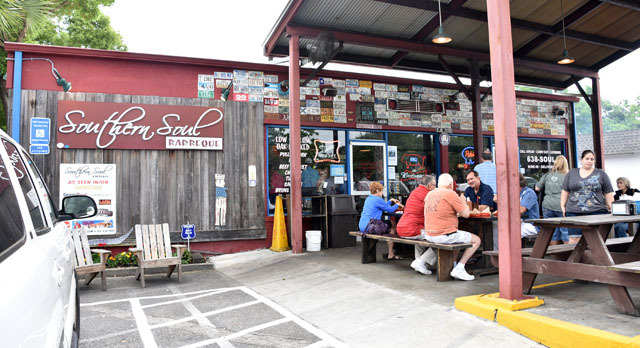 That’s Southern Soul Barbeque, a short walk from the FBO. It’s not very flashy, and we’d have walked past it – but for the smell of barbeque wafting from the smokers next to the unprepossessing building. It was everything the article said it was. 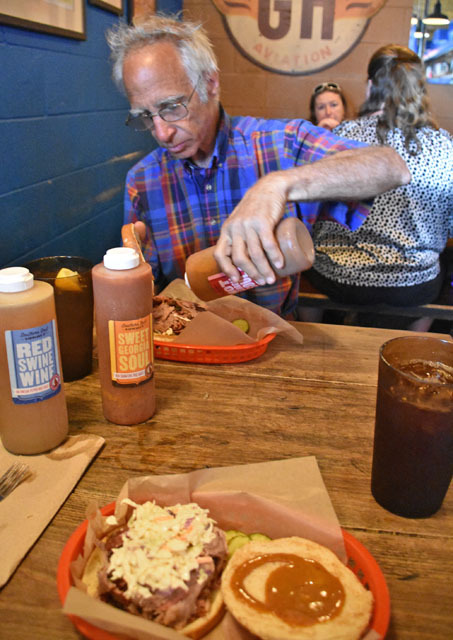 The pulled pork sandwiches were great. If you’re in the area, this is a good place to stop. 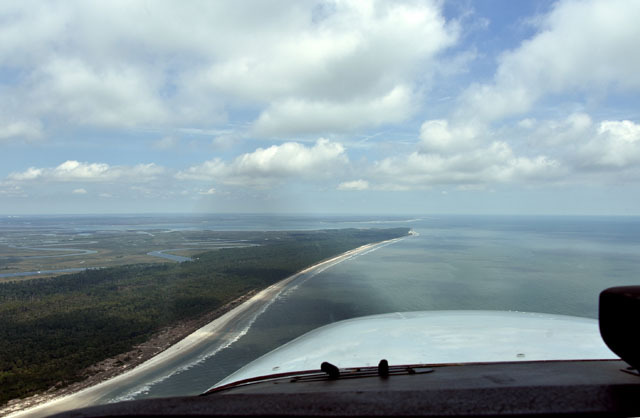 After we took off from KSSI, the ceiling started dropping as we climbed and headed up the coast. We were clear beneath at 600′ or below, but what had been a broken deck had become fairly solid. The visibility was still pretty good, though. 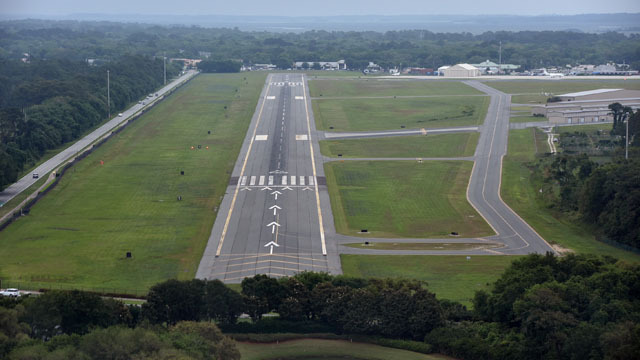 Our destination was reporting clear skies, so if we could get above the thin layer, it would be VFR all the way, so while I plugged along, Jerry called Jacksonville to see if he could file IFR to climb through the deck. 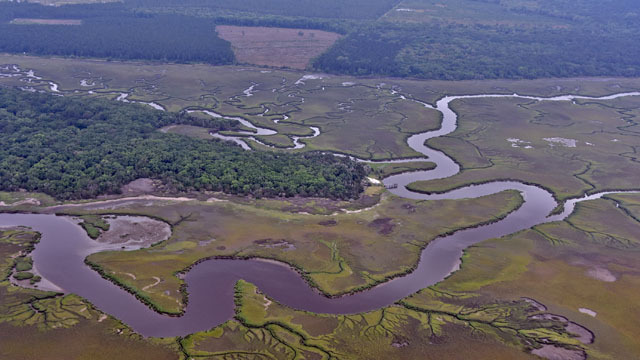 By the time Jacksonville got back to us, though, the ceiling had lifted up to at least 1,800 feet with good visibility under, so we let it go and I continued flying. Blue sky appeared as we passed Tybee Island, Georgia, and it was clear and beautiful from then on. 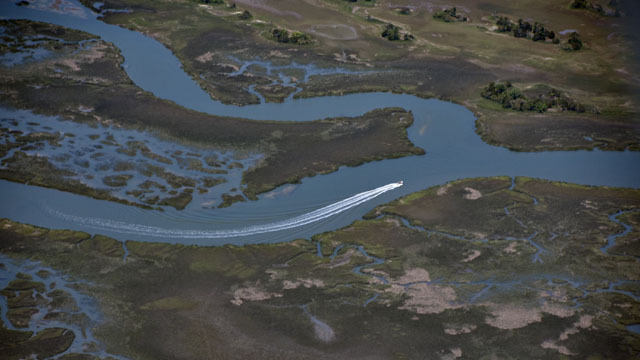 A boat winds through the channels in the mudflats on Fripp Island, South Carolina. 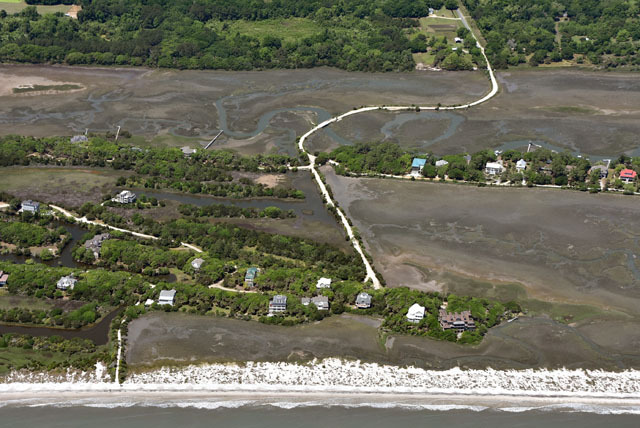 I guess it was low tide – the road to these houses stands out against the mud flats. 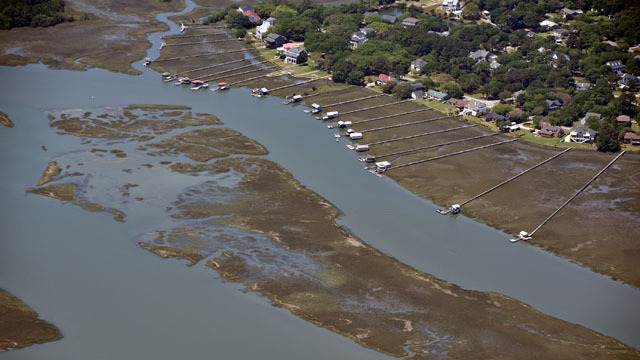 All of these houses have boathouses on a channel – but it looks like they need incredibly long walkways to get to them. 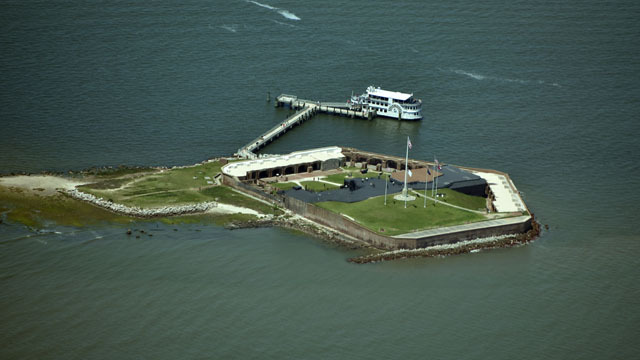 Fort Sumter in Charleston Harbor, where the Civil War started 154 years ago this month. 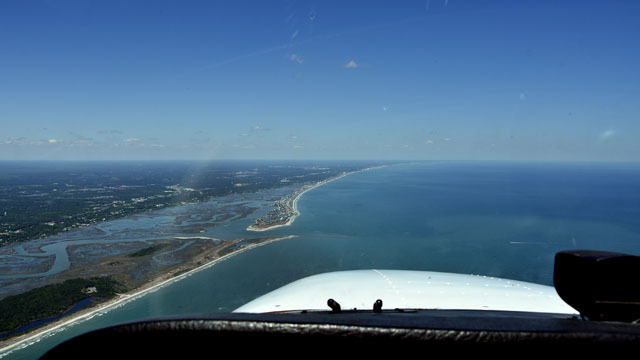 We headed back offshore as we approached Myrtle Beach, so as to stay out of the mix of airspaces. 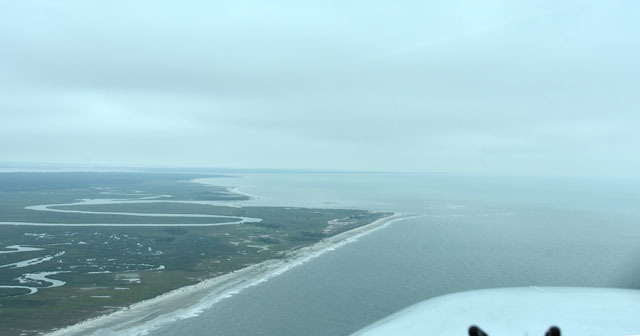 Myrtle Beach Approach was very accommodating about clearing us through the Class C and Class D areas just inshore, as long as we stayed off the beach (but within gliding range of shore – no floats on 493!). 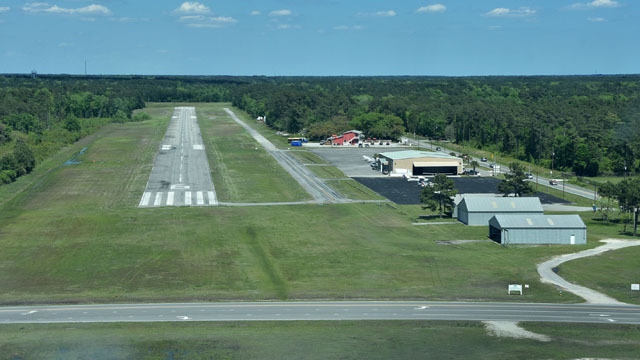 A few miles north of Grand Strand Airport (North Myrtle Beach), we switched over to 122.9, and soon we were on final for Runway 6 at Odell Williamson Airport in Ocean Isle Beach, North Carolina. 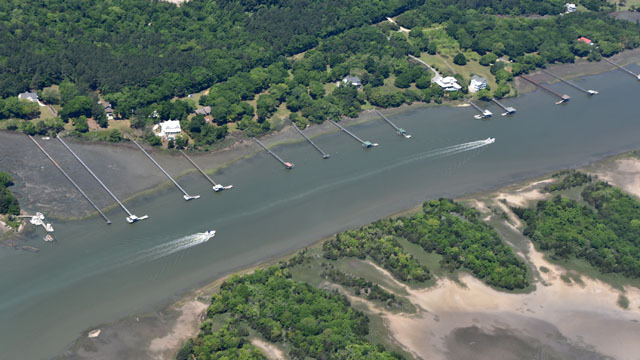 Pingback: By Skyhawk to Florida – Sun’n Fun | EHFC Members Talking! 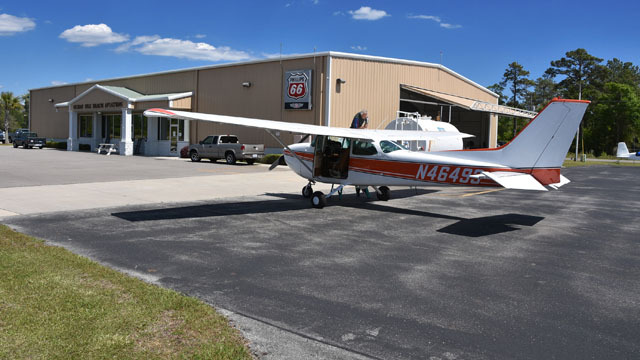 Pingback: By Skyhawk to Florida – Day 8 – Back home! | EHFC Members Talking!